In this four-week series, you'll help your students explore the nature of their heart--and how to develop a heart that seeks to reflect the character of God. The state of one's heart is central to guiding one's faith.This series will have teenagers developing four heart qualities:Week 1: A Heart for Others--Caring for peopleWeek 2: A Heart for Quality Relationships--Developing meaningful friendshipsWeek 3: A Heart for Spiritual Change--Heading God's wayWeek 4: A Heart for Serving Others--Putting love into actionGod's love is more than anyone can imagine. This series will not only help your students understand it, but also live it. 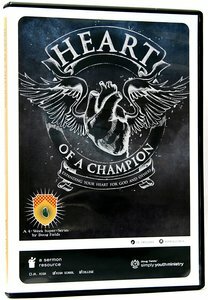 About "Super Series - Heart of a Champion DVD"